We've just returned from our 4th trip to Istanbul with our friends Kay and Scott from Touch the Earth. Touch the Earth is an import business that wanted to carry more ethnic musical instruments; and they knew we knew Istanbul. It was the fourth trip to Istanbul for us(Ted and Carla). So, we went to help them find sazes, zurnas, and other Turkish instruments. They also came back with some fabulous textiles, jewelry, and other fun stuff. It really was quite an adventure. Istanbul is an incredible city.  As you walk, you can't blink, or you'll miss some wonderous sight. We ended up doing more socializing with the Turks than we had done on our previous 3 trips. The highlight of the trip was the festival that occurs at the Hippodrome during Ramazan. We spent 3 nights listening to the asik play in a large tent that had been set up as a tea room. 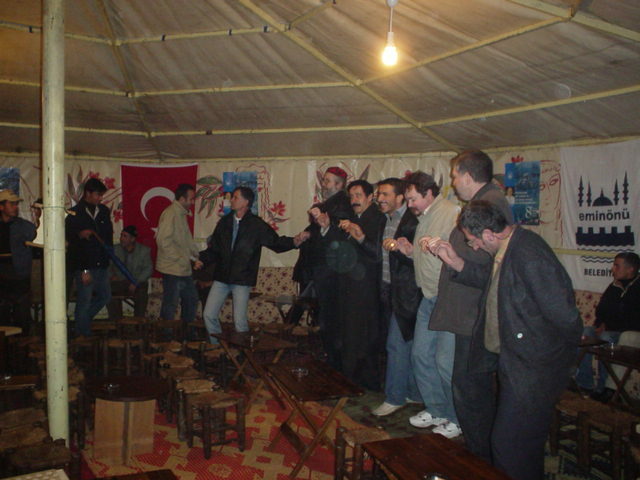 Here's a photo of Ted, Scott, and our friend Bob dancing with the Turks. Seeing Bob in Istanbul really made a big difference in the trip for us. 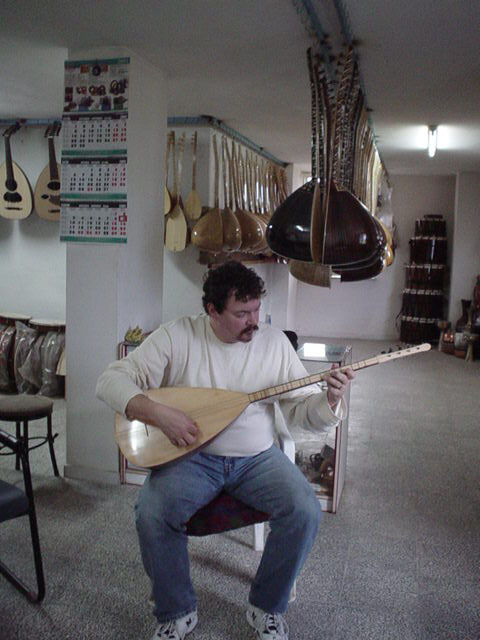 Bob is an excellent saz player who left Seattle to spend some time in Istanbul studying saz. He's been there for 4 years and he took us to all the most interesting Turkish restaraunts. One day we took the ferry across the Bosphorus to visit a saz maker. Afterwards, Bob took us to a restaraunt specializing in food from Gaziantep. Of course, we did alot of shopping. Scott and Kay were properly dazzled by the covered bazaar. Other than music shops and factories, that was where we did most of our shopping. There is a large increase in Afghani merchants with lots of Silk Road goodies. 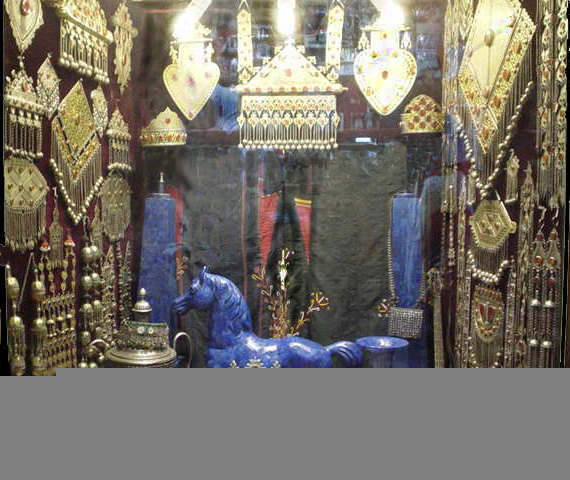 Below is a photo of a shop window with some fantastic Turcoman jewelry. 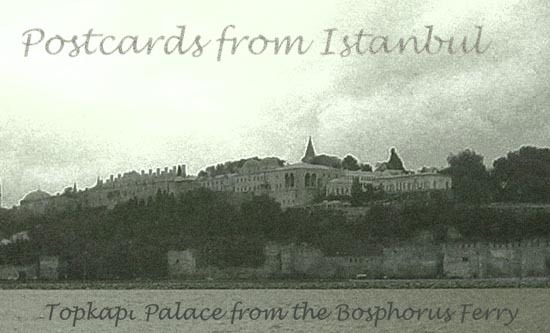 Check out our page of Istanbul Travel Tips!